Posted by Maury Markowitz in fusion, nuclear. I like fusion, really. I’ve talked to some of luminaries that work in the field, they’re great people. I love the technology and the physics behind it. But fusion as a power source is never going to happen. Not because it can’t, because it won’t. Because no matter how hard you try, it’s always going to cost more than the solutions we already have. NOTE: this article used to contain a lengthy section outlining the tremendous technical issues still to overcome. It had nothing to do with the real argument, so I’ve removed it. A while back MythBusters decided to take on the task of building a lead balloon. As it turns out, with enough effort, one can indeed make a lead balloon fly. So now that we have working lead balloons, you should be able to book a flight on one to London any day, right? What, you don’t expect that? Well of course not, because we already have the 747. Sure, spend a lot of money and maybe lead balloons will get better. But airliners keep improving too. The gap in performance is never going to close. Quite the opposite, because of the fundamental physics of the two, the gap will widen over time. So I’m pretty happy saying lead balloons for commercial flights to London will never happen. Never ever ever. And its the very same logic that lets me conclude fusion will never happen. Not so much on the technical grounds, which may very well never cross the enormous gap to commercialization. No, this is about the bottom line. Even if the engineering is someday fixed, it’s clear to everyone outside the fusion world that the economics will never be competitive. Not now. Not in 20 years. Not ever. It’s easy to think that power generation is a technical issue, that once you build the working gazeza box everyone will start building them. This simply isn’t how it works. There are three groups involved in building a power plant, and a design has to make all three happy. First, and most obvious, is the power company. They really don’t care about technology. Their only concern number called the Levelized Cost of Electricity, or LCoE. LCoE basically tells you how much you have to charge your customers for the power generated by the plant. That number has to be similar or lower than the price you can buy it from other plants. There’s no point building a plant if your customers are going to buy the product somewhere else. The power company operates the plant, they don’t build it. The plant will be built by an engineering firm like SNC-Lavalin. They don’t give a crap about the technology or the LCoE, the only thing they care about is making a profit building it. Is this a machine that lots of people have built before and is well understood? No problem. A new concept that no one really knows much about? You’re going to have to pay them a lot more. And finally, and most important, are the bankers. They don’t give a crap about the power company’s profitability or the construction company’s, they only care about their profitability. And that is 100% based on the interest they can charge the power company and the risk that the company will default. Right now the nuclear power industry is dying a horrible death everywhere in the western world. That’s because the bankers won’t pay for it. There is no other reason, regardless of what you might hear to the contrary. No, it’s not because of some patchouli-scented tree-huggers or a global conspiracy of anti-nuclear government agencies. It’s the bankers. Option 1 gets the money every time. Not in theory. This is clearly what is happening in the real world. You can argue the technical superiority of fission over wind all you want – in fact, it’s pretty much all true. It is a fact that wind cannot be dispatched while nuclear has a CF around 90% and provides all sorts of baseload. It is a fact that nuclear takes up less land than the equivalent in windmills. Add any of the other advantages you’ve heard, they’re probably true too. Here’s the problem with all of those arguments: the bank doesn’t give a crap. So the places that are building nukes are invariably where the local government is willing to put up the money, generally interest-free We have new reactors in China and Korea, and everyone else is doing basically nothing. Actually, in the US all the money is backed by the government, and the companies have ignored it anyway. It’s just too expensive and economically risky. The first group currently contains only one member, large-scale PV solar plants. Light falls on them, electricity comes out. It’s not perfectly direct, you have to convert from DC to grid standard AC, but by any measure, PV is the simplest form of large-scale power available today. The next group are those forms of power that use a turbine that is directly powered by its fuel. Hydro is a good example; water goes through the turbine, the turbine spins a generator, power comes out. This class also includes wind generators, geothermal and natural gas plants. These systems have moving parts and are thus more complex to build and maintain than PV, but generally offset those costs through the density of the power which lowers relative construction costs. 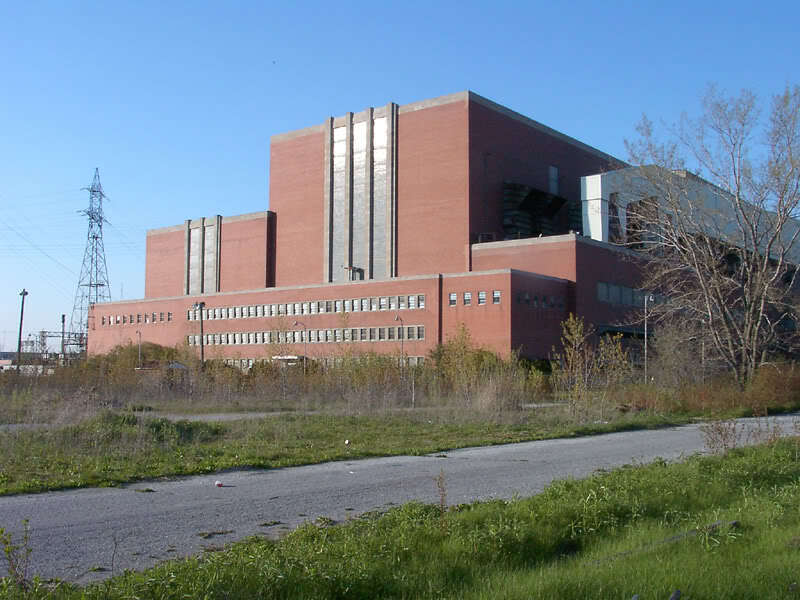 The Hearn coal plant in Toronto, image by “CanadianNational”. The turbine hall is on the left in the lower building, and the burners on the right. Finally, there’s the last group, the classic power plant. These consist of some sort of heat source – coal, gas, nuclear or even solar in some cases – which boil water and then use that to drive a steam turbine. These tend to be very compact and save money on land and construction, but offset that because they’re more complex. Now here’s the thing: the turbine in the heat engine case is basically the same price as the one in a gas plant, watt for watt. But a heat plant isn’t just a turbine, it’s all the other stuff too. If you look at any plant in this last group, you’ll notice that the building is always in two parts, the “burner” section generating heat, and the turbine hall. And the burner part is always bigger. All of this means that classic heat-engine power plants are always more complex than other forms of power. Now complexity doesn’t always turn into price, but it often does, and almost always does in industries that squeeze the systems for efficiency. And the energy market has squeezed. Hard. Pickering is up the street from me. See the reactors in the center and turbine hall to the left? To put this in perspective, let’s examine the nuclear plant example. Overall a nuclear plant is a lot like a coal plant – there’s the reactors on one side producing heat, and then there’s a turbine hall generating power from that heat. In the industry lingo, the entire reactor side is known as the “nuclear island”. That part makes up about 1/3 of the price of the system as a whole. That means that if you take the average price for modern reactors, $7.60, about $5 of that is non-nuclear. Which is important. Because that means that even if the reactor were free, the plant as a whole would still cost more to build than a wind turbine. Not just more, three times more. I know, I know, the power from that reactor is almost 24/7 and you can’t rely on wind. Go tell it to the only person that matters – the banker. Let me know how that goes. The basic argument I’m making is that if the bankers aren’t willing to fund fission, because it costs too much and takes too long to build, then they’re definitely never going to fund fusion. To understand why, consider that a fusion plant is basically the same as a fission plant, but with a different reactor. All the other parts, the heat exchangers, turbine hall, etc. is the same. So we need to understand how a fusion reactor might compare to a fission reactor in terms of design and economics. It’s tough to say exactly how much a fusion reactor will ultimately cost, because we can’t make one that works. But that just means there’s no limit on the upside price. We can make accurate predictions of the lowest possible cost in the best case scenario. So let’s do that. DEMO is big. Really big. What we know is that any sort of fusion plant will be fantastically complicated, orders of magnitude more complex than a fission design. It is filled with incredibly complex machinery for fueling and tritium extraction, all sorts of heating systems, ridiculously expensive superconducting magnets and all their cryogenic support machinery, the heat extraction system which has to be built in two separate parts (some of the heat goes into the lithium blanket, some doesn’t) and complex control systems. Now once we’ve built it, we then have to put the whole thing into a ridiculously good vacuum state, or it just won’t work. And that costs a freakish amount of money. And then there’s the lithium. We need lots of it to get tritium breeding. 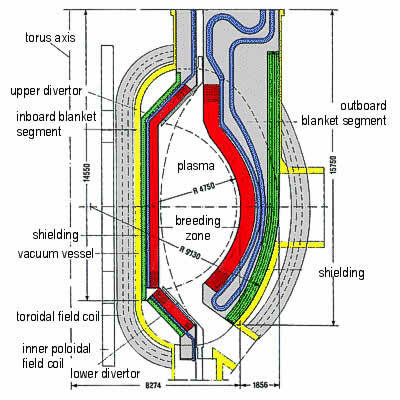 Lots as in at least a 1 meter thick layer lining the entire reactor core (the red part in the diagram). That’s maybe 10,000 tonnes. Lithium is selling for about $7/kg, but that’s mix of the Li-6 we need and the Li-7 that is most of what we get. Realistically, we’re looking at prices around $180/kg (see notes) which represents a cost-per-watt of $1.8/W in this design. That means the lithium alone is more than the cost of a wind farm that produces the same amount of energy. And that’s for one raw material out of hundreds. And the rest are even more expensive. Superconducting magnets? Ugh. And then on top of that, the energy they produce is so diffuse, you need huge plants so even the cost of construction will be enormous. The diagram is the baseline design for the DEMO reactor. If you look carefully, you can see that this cross section is about 20 m high and 12 m across. A reactor would consist of many slices like this, arranged in a ring that would be about 30 m across. This is just the pressure vessel, the reactor as a whole would be many times larger. For comparison, the General Electric BWR power reactor has a core that is about 8 m across and 21 m high. In other words, this single slice of the DEMO is larger than a BWR’s entire core. A complete DEMO core would require an enormous containment building. One can judge by ITER, a sub-scale version of DEMO; ITER’s floor alone consumed 220,000 cuyd of concrete, and at current prices that’s 15 cents/watt just for the floor. That’s 1/10th the cost of the entire wind farm. For the floor. The floor. Now back to the start… no one would build a fission plant today even if the reactor were free. A fusion reactor will always, always, cost way more than fission. Now here’s the key point I’m trying to make: it’s not that fusion is expensive, it’s that everything else is cheaper. And the last thing anyone needs is a more expensive form of power. We already have an infinite variety of those. Imagine some future where we’ve covered the entire surface of the planet with wind turbines and we still want more power. Then we’d use fusion, right? No! We have hundreds of other sources that are also completely renewable that we already don’t use. We’ll just pick one of them. Then the next one, and the next. Fusion is somewhere like #100 on the list. There are two things on this wind turbine that aren’t also in a fusion plant. One of them is the observation deck. I know at this point you’ll dream up some reason why fusion might get cheaper. So maybe you think it could move down the list from 100 to 10. But the fundamental problem is that most of the ways that could happen would make other things cheaper too. So, for instance, if you come up with a way to build a steam turbine for half as much money, you do indeed lower the cost of making a fusion plant. However, you’ve also lowered the cost of making a fission plant, and a coal plant too. You’ve probably lowered the cost of a gas turbine as well, and maybe even wind. So you’re in exactly the same place you started, everything else is still cheaper. Now there are some parts of any power plant that are unique, like the fibreglass blades on a wind turbine or the superconductors in a fusion plant. Ok so let’s say you argue we could lower the price of those superconductors to make the fusion plant cheaper relative to wind. But look at the math; in order for this to make it cheaper than wind, those superconductors have to cost negative dollars. I’m not methuselah, but I’ve lived long enough and not once did I see a power plant that cost negative money. We’re not going to fly lead balloons commercially. There is always going to be other solutions that are better, and we already have them. And we’re never going to use fusion for widespread commercial power. There is always going to be other solutions that are better, and we already have them. Well, no, it doesn’t. Fusion reactors don’t produce oil, they produce electricity. And we have lots of other ways to produce electricity. And lots of those are cleaner, cheaper and actually work. But most importantly, the price of those systems keeps going down, not up. Fusion is becoming less and less attractive as I write this. Literally. Scaling of the construction costs from the Bechtel estimates suggests a total plant cost on the order of $15 billion, or $15,000/kWe of plant rating. At a plant factor of 0.8 and total annual charges of 17% against the capital investment [ed: principle paydown and interest], these capital charges alone would contribute 36 cents to the cost of generating each kilowatt hour. This is far outside the competitive price range. The nuclear industry periodically produces reports that estimate what sort of price they predict out into the future. In a relatively recent study, found here, you’ll see on page 4 that the price of energy from fusion remains higher than any other source even when you predict out 100 years. And I would suggest that the numbers in this document are being really optimistic in terms of the reductions in CAPEX possible in a fusion plant. However, among those who are not part of ITER and who do not expect miracles, an ever increasing number of scientists is coming to the conclusion that commercial fusion reactors can never become a reality. Note the “never” part, yet another reason I feel safe in my conclusion. First, we have to recognize that practical fusion power must measure up to or be superior to the competition in the electric power industry. Second, it is virtually certain that tokamak fusion as represented by ITER will not be practical. The basic argument for fusion from the start was that electricity prices will keep rising, and all of our existing sources will eventually run out. But that didn’t actually happen. Usage eventually reaches a slow rate of growth that we can easily make up with existing sources. And as a result, existing sources were put through the wringer to squeeze out the costs. PV has fallen in cost over 100 times. Fusion, meanwhile, keeps getting more expensive. No, I’m not saying we should use wind and PV for all our power. But what I am saying is that the very niche that fusion advocates suggest makes that power source so great can be filled with sources that we have today and are far cheaper. Why would anyone want to spend a lot more money to get the same thing? It is late, but perhaps not too late, to acknowledge that the ITER project is at this point nothing more than an expensive experiment to investigate some fundamental aspects of plasma physics. Since this would in effect acknowledge that the current ITER funding process is based on faulty assumptions and that ITER should in all fairness be funded on equal terms with all other basic research projects, acknowledging these truths will not be easy. Yet, it is the only honest thing to do. Allen L Hammond, William D Metz, and Thomas H Maugh II, ‘Energy and the Future’ Washington DC, American Association for the Advancement of Science, 1973. Lawrence E Lidsky, ‘The Trouble With Fusion’, Technology Review Vol. 86 October, 1983. Pages 32-44. Deuterium/Tritium fusion may never be practical, but it’s an important step towards fusion using plain hydrogen or helium. This of course requires higher temperatures, so the “easier” Deuterium/Tritium process is valuable to study in the mean time. You should do another article on pB-11 fusion similar to what the folks at focusfusion.org are trying to accomplish. Only 1 in 20 million water molecules is D2O. The processes for making heavy water don’t just extract the D that’s in D2O; they also get the D that’s in HDO. Water molecules are exchanging these atoms constantly, so it’s not like the only D2O molecules you end up with are the ones you started with. Sure, at 1 in ~3200. It doesn’t really change anything, especially the shutdown of the only major civil producer. About the lithium: fusion uses lithium-6 (and a bit of lithium-7 for neutron multiplication in the blanket). But natural lithium is 93% 7Li. So, the 6Li could be separated out and most of the rest used for non-nuclear applications (like batteries or Corningware). Fun story: a lab some years ago bought some commercial lithium for a nuclear detector. When it didn’t work, they discovered the lithium they had bought was almost pure 7Li. It was apparently waste lithium (sold back into the market) from the isotope separation plant used to make enriched lithium for hydrogen bombs. Paul, you’re absolutely right. I’ve made some edits in the article to address this. In fact, one might say that an electric car economy would likely lower the cost of Li7 a little, and a fusion economy would lower the price of Li6 a lot. So to extend the conversation we could also posit that it is highly unlikely that PV or wind as dispatchable power sources will ever be competitive with fission or fossil energy spare for perhaps rare cases where wind/solar resource is especially strong and this can be mater with compressed air storage in natural caverns or pumped hydro storage in natural reservoirs. Would you agree with this, and if this is true isn’t addressing fission the most important task we are faced with? The reason I suggest PV and wind will never be competitive with fission is because there are strict limits on efficiencies improvements for each, and each utilizes storage and transmission infrastructure less efficiently (meaning more cost) than inherently dispatchable plants can. Obviously PV and Wind will never power the entire world, and it’s a nice thought that these sources could integrate well with advanced fission plants, but the reality seems to be that these two sources have little scaled compatibility with each other in economic or technical terms. I’d be interested to hear your opinions on this and on the future of fission energy in general. George, what matters is not the efficiency of PV/Wind, but their cost. The cost of each has been declining. In contrast, the experience curve for nuclear is nearly flat. This latter fact is damning, and unless it can somehow be changed nuclear has no future, and will eventually become uncompetitive. It will become cheaper to cover the intermittency of renewables by other means, for example by simply overbuilding them. I find the arguments a bit dubious. If they were REALLY true, and following the same reasoning as the author describes why fission, fusion, peanut oil etc. do not and will never work.. then today the only things that would produce electricity would be coal-fired plants, because they are the cheapest. And they have been for decades and decades. Which makes it inexplicable that there ARE other electricity installations, based on oil, gas, fission, solar, wind, etc. If his premise were true, those other sources of energy wouldn’t ever have been created and made. Yet they did and are. So…clearly something is amiss here, and his premise DOES NOT seem to be correct. The most glaring omission in his theory, is that he reduces everything in economical terms from a limited amount of players. Of course, this is not true. For instance, the government can decide to build things. They don’t care about banking profit or anything else he mentioned: if they really want to build it, they’ll do it. And use taxpayers money for it. In a way, the public opinion can make a shift too. You see that happening with the current (albeit not very rational) trend for renewable energy. Why would that matter, if coal is far cheaper than those, and renewables can’t survive without heavy subsidies? According to his own theory, coal (soya) would always win from renewables (peanutbutter), as long as coal (soya) is around. This is clearly not the case. Hence, his theory is obviously in error, or at least, has severe shortcomings and needs adjustments. Coal hasn’t been the cheapest form of power for well over a decade. Modern coal plants cost about$4 a watt while natural gas peakers are around $1.25, wind is around $1.50, and PV is around $1.75. And if you look at install rates in the US, it’s natgas, wind and PV, 1, 2 and 3. Google “Lazard lcoe” for up to date numbers. Well, maybe since fracking has become common place, gas has become cheaper in the US. In many other places it didn’t, however. I refer to the numbers and graphs of https://en.wikipedia.org/wiki/Cost_of_electricity_by_source and there one can see that in many countries coal is still the cheapest. As for wind: let’s not forget it’s heavily subsidised (at least in the EU), and the numbers often reflect the theoretical maximum of windmills, not the actual delivered energy. Since windmills sometimes only deliver only a third of their theoretical maximum, one can doubt if they are really that cheap. Also, since it can’t provide a baseload due to it’s stochastic nature, and gas/coal plants have to run continuously to make up for the gaps and peaks, one would actually have to count those gas/coal-plants too, if one want to look at the total picture of a stable energy supply of a country (in reality, instead of just theoretically). This would augment the cost even further. But regardless, this is a bit besides the point. Even if one would take gas as being the cheapest – or any other energy-source for that matter – the point is, that if the theory which has been presented would be true, one would not have a mixture of different kinds of energy-sources. Only the cheapest would have prevailed (the soyabean ;-)). Alas, if we look at reality, we can see a plethora of different energy-sources, from the time of industrial civilisation until now. We now have coal, gas, nuclear, solar, wind, geothermal, water(dams), biomass, etc. Note that you do not claim: ‘why fusion will never be the cheapest’, but ‘why fusion will never happen’. This does not go well with your theory. IF it were true that only the economic incentive would prevail, than there would be one or two (tops) – namely the cheapest – around. Yet, in practise, we see more than a half dozen different sources of energy. Some of which are clearly far more expensive than others. It directly contradicts the major argument you put forward, namely that “We won’t burn peanuts until all the soy is gone.” If that were true, we would still be with coal and gas, since coal and gas aren’t gone, and are still the cheapest around. It would be inconceivable, following your theory, we even ever got to the point of fission, wind, solar, etc. As it stands now, it does not explain this contradiction, and viewed as such, it’s obvious faulty. > Alas, if we look at reality, we can see a plethora of different energy-sources, from the time of industrial civilisation until now. We now have coal, gas, nuclear, solar, wind, geothermal, water(dams), biomass, etc. You are missing two important factors in your statement, time and space. The time dimensions reflects fuel costs and technology improvements. In the 1960s, nuclear really was quite cheap, but fuel price fluctuations, regulatory ratcheting and the cost of the building materials killed that. On the flip side, gas represented a very small slice of the pie until the NG prices dumped and the coven plants got a lot cheaper to build. So over time you see less nuclear and more gas. Far cheaper than any of these is hydro, which is around 1.1 cents CAPEX, yet supplies only 7% of the US grid. That’s because of the space factor, there’s only so much of it that’s cost effective. The same is true for wind and PV, to a lesser extent coal (shipping costs are non-zero) and almost not at all for nuclear and gas. Yet fusion is far, far more expensive than any of these, in some cases by a order of magnitude. Even wind at its worst, or PV in the arctic circle, is going to be less expensive. But feel free to make spreadsheet showing otherwise if you wish. Now, you make some good points, but I think you forget one important factor, and that is the government subsidies and the political/public factor. For instance, as far as I know, nuclear plants have always been subsidised, and the insurance has always been paid by the government. Would nuclear really have been cheaper than the cheapest energy-source around, at that time, if this hadn’t been the case? I somehow doubt that. But why did the state do that? Certainly not for economic reasons. Now, you say: nuclear energy is dead… but that doesn’t really conform with reality. In China and India, there is a huge expansion going on of nuclear plants, and even in some Western countries, there are still new ones being build. Why, if your theory is true, would they still do that? If it’s obvious that gas and coal are cheaper, and that is the only incentive, than it doesn’t make sense to still build them. Another example. Let’s take, then, a more recent example. Wind-energy by windmills. Now, there is no doubt that, when windmills started to get traction, 20-25 years ago, it was *definitely* more expensive than gas and coal, at that time. Even with your two factors of time and space, this doesn’t really seem to explain why one ever *started* wind windenergy. Back then, wind-energy was far more expensive, yet, it got made and is now fairly common. Yet, if peanut-oil (the more expensive, aka, wind) would not be be used before the soyabeans (aka, gas or coal, whatever was the cheapest back then), then it’s inexplicable why it would have been started nevertheless, according to your theory. In reality, just as with nuclear, windmills were heavily subsidized (even upon this day, in many countries) by the state (thus, with taxpayers’ money). This wasn’t done because there were no cheaper alternatives available anymore. Nor did the banks or power companies have a sudden move of altruism. It is highly doubtful, in fact, that windenergy would be where it is today, if that heavy subsidy of the state had NOT taken place. Because it’s only because of that, that it peaked the interest of companies and banks. Now, again, I’m not saying that fusion will be cheaper, and it might well be that it never takes hold in a totally free market, as you say. But I do not think one can say it as an absolutism that it ‘will never be’. It’s quite possible, if the government/state subsidizes it enough – and even when cheaper alternatives are available – it could, again peak the interest of banks and companies, and then it *will* be build. So, yes, companies and banks are only looking at the profit, but they *do not care where the profit is coming from*. Ergo, if it comes from subsidies, they will take it too. But that still means, fusion-plants could be build, even if they’re more expensive than alternatives that are around now. Also…it’s difficult to predict exactly how fusion will develop. For instance, while one could make the case it will be an order of magnitude more expensive, I’m guessing you’re taking ITER (tokamak) as an example. But it could be that ultimately, it will be something else, like Polywell, Fusion Focus or stellerator, that takes the light. Which are, at least potentially, far more compact (and thus cheaper) than ITER. So, is it really all that certain ‘fusion will never be’? I don’t know. It depends on what sort of fusion, how much energy can it deliver compared to the price it costs, how much the costs will decline, how much subsidies governments are going to pay, etc. Which doesn’t mean you’re wrong that, if it is and remains hugely expensive, and the public nor the state want it, nor want to subsidise it, it will not be able to compete in the long run. I can agree with you there, but my critic was just pertaining to the theory as you’ve explained it here. Personally, I don’t think fusion will be necessary neither. It’s interesting as a scientific and technological endeavour, but – especially the tokamak – does seem to be lacking as a viable cheap source. However, I think things like LFTR, which is a 4th gen thorium based nuclear plant, have far more potential. It’s still basically fission, but much safer, much more compact, much more cheap overall and even has the potential to be mass produced as modules. From an economic perspective, this is far more interesting than fusion, and even than our own current nuclear plants. I think the only thing keeping it from being developed (at least in the West, they *are* building it in china, of course), is the public opinion (and thus, politicians), which gets rather emotional and negative, when it comes to anything that has to do with ‘nuclear’. Purely from a rational, economic perspective, however, it has great potential. “For $20 billion in cash,” Steve Cowley of Culham says, “I could build you a working reactor. It would be big, and maybe not very reliable, but 25 years ago we didn’t even know if we’d be able to make fusion work. Now, the only question is whether we’ll be able to make it affordable.” This statement was made with full knowledge that even the basic premise of virtually limitless fusion power on Earth has never been demonstrated. Giving fusion researchers $20 billion would thus be totally irresponsible. But if by some miracle they succeeded in solving the myriad problems of reactor degradation, stable confinement, energy conversion to a useful form, etc., it would still be “the moral equivalent of giving a loaded gun to a mentally retarded child” (from Paul Ehrlich). So nuclear power commercially might be more expensive than everything else but I think its a replacement for coal due to its alleged low carbon emissions. Clean coal either wont happen or itself will be too expensive commercially to nuclear could be seen as a direct replacement for coal. After all CSP, PV and Wind for many blight the landscape and dont sit well unless you have a massive country which fortunately North America, China and India to so its all good there. Lets factor in Global warming and its main cause (Carbon emissions) and see what is commercially viable as much as for just using energy. After all the current push for electric cars etc will make going from 20% of our current energy needs to about 80% from electricity mean that we need all of the low/non carbon sources we can lay our hands on. While the percentage basis will change considerably, the total amount of energy actually goes down dramatically. And even the amount of electricity used in total doesn’t go up that much. I haven’t calculated it for the US, but I did for the UK – electrifying all of their cars and light vehicles would require only 20% more electricity than they currently use. That’s less than the CF headroom of their existing fleet, so they could make up this power simply by running their existing plants longer. This is all due to the fantastic energy efficiency of an electric motor, which even including all losses is on the order of 2 to 4 times as efficient and a normal car. Ok I just ran it. Last year the US drove 3.2 billion miles. A Tesla S, which is heavy, used about 0.3 Wh/mile. So that’s 960 billion kWh to drive all the cars in the US, aka 960 TWh. Annual generation in the US is 3921 TWh, so electrifying all the cars will require about 20% more generation. So to summarise even if fuel were free, and the plant were only as expensive as a coal fission or gas plant, and the fusion reactor were free, it would not be that much cheaper then fossil fuels or fission. And it is in fact facing significant competition from pv wind or pv & wind plus batteries for baseload competition (if these continue their current cost declines) . The only areas fusion would have an advantage are in very unsunny or not very windy places. Very far poleward, or out around pluto. Fusion has advantages in energy density and commoness of fuel out in deep space. Also it can be used for a high impulse drive . This has little direct relevance to power production on earth however. Little has changed in the last three decades. While working on the TFTR project in the late 80’s, I made a cartoon which I posted in my office. Up in the top, right corner was a smiling, radiant sun. What’s really amazing is the efficiency of the panels. Modern commercial examples are 18% on an areal basis, which is well over half of what you might get out of a fusion reactor. Yet no moving parts and it consists largely of a sheet of glass. 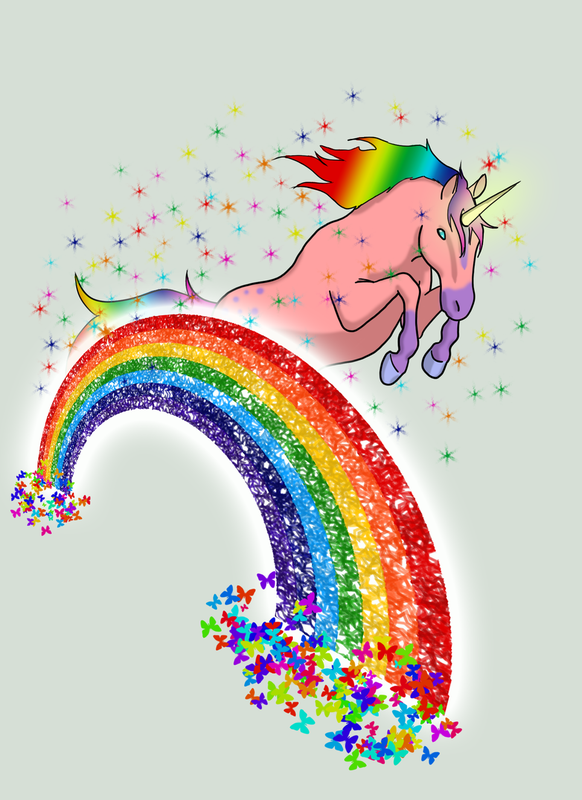 Returning to terrestrial fusion, as a long-ago “failed physicist” myself, I have been amusing myself lately by looking at the current state of fusion efforts. I understand that your argument here is that cost alone condemns fusion as a means for practical power generation. But as Dan’s article discusses, fusion reactors (at least, tokamak magnetic confinement fusion as the current straw man / pack-leader) face many other enormous hurdles. The funny thing about this is that essentially every argument Dan now makes was fairly well known/understood 30 years ago. Dan himself back then worked on designs for future fusion power reactors and was expert on the subject. I daresay a fair deal of refinement has been added since then, but I saw nothing essentially new in Dan’s recent article. So you have to wonder about a community (to his credit, evidently no longer including Dan) that continues to advocate controlled fusion as a feasible future power source. To an outsider, it’s almost like they are collectively delusional. Having known many of the very bright and often quite grounded people who have worked in this field, I would not myself accuse them of being delusional. But there is I think a serious, yet perhaps entirely understandable failure to make the sort of realistic self-assessment that would likely condemn their own careers. And I believe this has long been endemic in the fusion community. As an example of “unrealism”, take Steve Cowley’s statement quoted above (“For $20 billion in cash, I could build you a working reactor.”). You only have to look at the cost of Iter – far from a “working reactor” – to realise that this is a fantasy. Iter will cost way above $20 billion at completion, not even including the massive “hidden” cost of all the components “donated” by the member nations. But when you look at the current state of Iter with massive cost overruns and schedule slippage, to express anything other than optimism to the politicians faced with funding decisions would be potentially fatal. What would you do if you were part of that physics/engineering community? I used to have a lengthy section on the technical issues, but I removed it for clarity. But that said, in addition to Dan’s issues with tritium, we have no idea whether we can breed it. This is *absolutely* required for a practical fusion device, yet there is no evidence we can actually do this, and even the best theoretical studies suggest it’s *barely* able to replace its own use.